In February, I will be accompanied by two New Media Arts students, Joseph “Seph” Turnipseed and Fernando Charley will present as part of the New Media Caucus events being held during the College Arts Association conference in Los Angeles, California. The presentation will include examples of student and artist-in-resident work produced for the Digital Dome @ IAIA. This event will take place on Thursday, February 23 at 8pm at the Glendale Community College Planetarium. Historically geodesic theaters have been used for exploring the stars in the planetarium. It is not until recent years that these theaters have become capable of presenting digital media. This innovation brings new life to the medium providing artists an endless amount of opportunities for creation. Still the fulldome medium has yet to define itself within the field of fine arts. 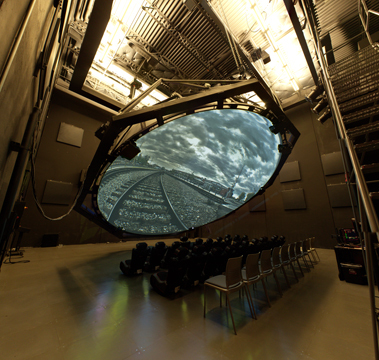 With over 600 digital domes around the world, the content being produced and shown is primarily science based and primarily intended for a fourth-grade audience. There is now more than every a great opportunity for the new media artist to creative interactive immersive experiences in the dome environment. The Institute of American Indian Arts has quickly become a leader in opening up the spherical theater for artistic exploration. The New Media Caucus is a non-profit, international membership organization that advances the conceptual and artistic use of digital media. The NMC represents artists whose media are expanding with developments in digital technology, artists working in emerging media such as robotics, virtual reality, interactive and installation environments as well as artists working in established digital areas of video, sound and graphics. By providing forum for the critical review of new media practice, the caucus increases the visibility and presence of new media practitioners. The College Art Association advances the highest standards of instruction, knowledge and practice in the visual arts to stimulate intellectual curiosity and advance skills that enrich the individual and society.